Since we are showing sickles of India, could we look at sickles / weapons of other countries like Malaysia, Indonesia. An other sickle from Kelantan Malaysia named there a Parang. For the next one I do not have any name and it looks essentially as a sickle . It is also coming from Malaysia. Can anyone tell me more about it? The following sickle is definitely a tool with an angle between the blade and the handle. The sharp edge is on the exterior of the blade. The interior of the blade being blunt and thicker. The next one is peculiar, I have no name for it, and do not know its origin, could be a sacrificial knife ? Purchased in Indonesia. Any information would be welcome. Last edited by Michel : 6th December 2009 at 02:53 PM. This last one is quite amazing. It is a goat(?) horn to which the blade has been fixed. The sharp edge is on the exterior, at the base of the blade is en enlargement to allow the thumb positioning. Nicely decorated with silver. A rice cutting tool ? Awesome pieces Michel! Thanks for posting these. I wouldn't call all of them sickle though as many have a convex edge while the sickle has a concave one. The Dacian falx and the Thracian Rhomphaia are additional examples of such weapons. Here is also a Spanish sword supposedly used against cavalry that features convex and concave edges. Thanks you for your message and the links. I did not know that sickles had to have concave edge. How do you name cutting tools with convex edges ? 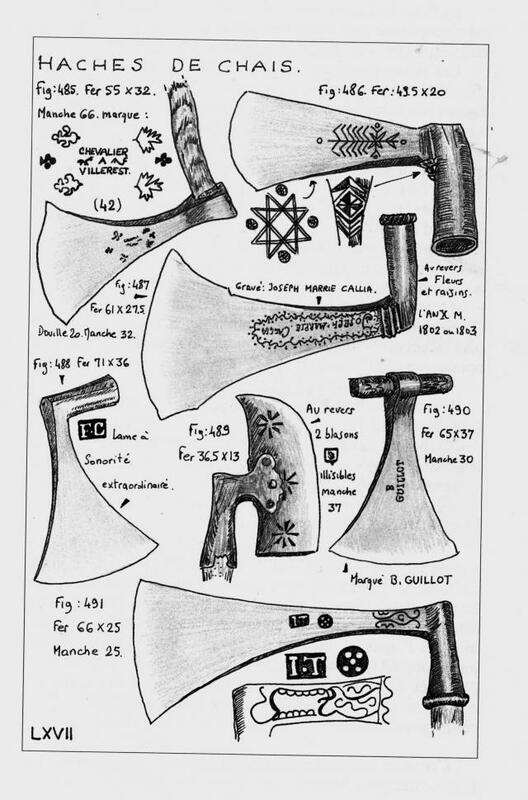 In French, my mother tongue, I do not recall a word for sickles with convex cutting edge. Sickle = serpe ou faucille, toutes les deux ont la lame concave, non? In English I think "machete" covers most kinds of large utilitarian blades. Sickle, bill-hook and scythe cover the concave blades. For arms, sabre, cutlass and "scimitar" all represent blade with convex cutting edge. I think most kinds of SE Asian klewangs would generally be termed machetes in English, regardless of curvature, thickness or blade profile. It is indeed a parang ginah, Stone page 481 and van Zoneveld page 98, (only a description no photo) confirm it. You are right with the French translation and the concave blade. But for me, a machete is a long strait blade slashing tool, with sometime a bit of an upwards convex tip, that can be utilized as a weapon. I have seen many in Africa and in South America. I have one from South America. Do you really think that the pieces I showed could be named machete in English ? I have never seen machete with such a convex curved shape. You said : Sickle, bill-hook and scythe cover the concave blades. You are right again but what about those with convex blades that are not arms/weapons ? English is usually a very precise language and I am a bit surprise that a generic name for convex tools cannot be found. May be one of the expert of the forum could help me ? Thanks in any case, I have learned something with your post. There really aren't many utilitarian convex blades that I can think of. As far as i understand it, in lay usage "machete" covers pretty much any large blade that is not a recognizable sword or sabre. Technically I think of it as a relatively thin blade with no distal taper, mostly straight with parallel edges and with a sometimes broader convex tip, used primarily for cutting vegetation. Variations are endless. It would be good to see others chime in on this, as I'm not a native English speaker. English is not always that precise. A while back there was a discussion around the difference between knife and dagger, bowie-type versus naval-type. Same as in French to some degree - couteau, poignard, dague, coutelas, subtle differences, all debatable. I think it depends on the version of English that you use. I agree that a sickle has to have the concave edge sharpened. These are single-handed tools primarily used for harvesting wheat, and the name has been used for others, such as the kama used to harvest rice and incidentally as a weapon.. Something similar to the kama is called a crane's bill, and of course, the two-handed version is called the scythe. In America, most of the large utilitarian blades are machetes, but that doesn't mean that any utilitarian blade in America is called a machete. In England, at least 100 years ago, they used bills/brush hooks/bill hooks, which were typically concave (although some were sharp on both sides), especially for hedging, but also for light pruning jobs. Two-handed bills (typically double-edged) are called blank blades or sling blades at major hardware stores in the US. The french name is fauchard, interestingly, we're back in falx land here. In Australia, machete-like blades are called bush knives. Probably there are sickles and the rest out there somewhere, but I don't know about them. I wouldn't be surprised if Indonesian goloks aren't percolating in as we speak. When in doubt, call it a knife, or call it a saber if you want to emphasize its military aspects. Thanks Michel for sharing these photos! very nice collection you have there. The second knife is maybe a ceremonial knife for cutting the umbilical cord, I have seen a similar knife by a friend, also collected in Indonesia. Interesting suggestion: a ceremonial knife to cut umbilical cord. I have made a quick search on Google but found nothing of interest. I will keep looking ! Is your mother tongue French ? Are you from Quebec and live in English speaking Canada ? You seem to be at ease with French ! The N° 4 has this very clear angle between the blade and the handle. For me in view of facilitating the slashing movement parallel to earth. But why this really convex blade with more than 180° cutting edge ? The n° 5 is nice looking but the horn come in to your arm if you try to cut with wrist movement. Strange ! I realize that the forum is full of members having experience with arms but much less with agricultural tool ! That too took my eye but I let it slide, did you win it at auction? I got the lots either side of it. what the hell is it? And what was either side? did I not notice? To be honest, I have no idea, I think Indian??? I think looking at the reasonalble quality of the piece it is worthy of further discussion. The other lots were a Sosun Patta "style" knife from North India and a very nice old Chinese sword catcher. Thanks for the email too. I didn't even see those!! Bloody ebay.uk blocking search results of knives. The Sickle has arrived today, I know it was described as Indian, but I really didn't think it was (so I added it to the list here of non-Indian). If you think it probobly is Indian, I better put it in another thread. Thai/Cambodian? Rice cutter/sickle. Horn handle. 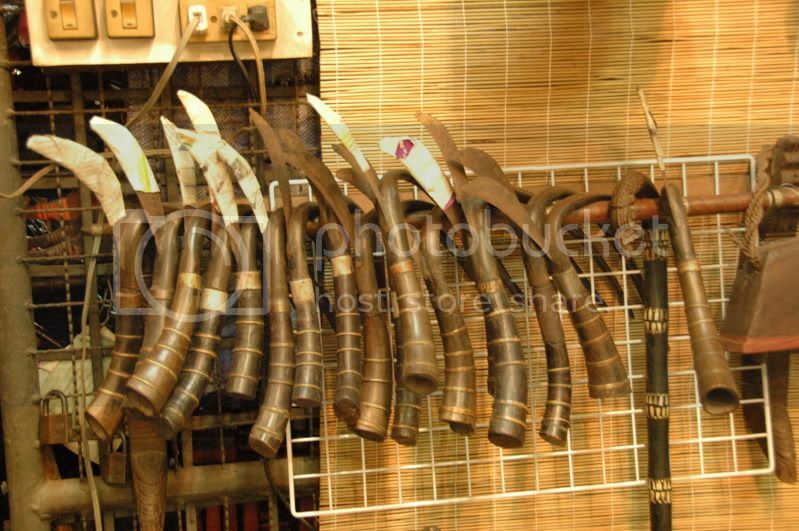 Your photo of these 15 or 16 tools from Cambodia do not clearly show the hook and the handle of these tools. They look at least similar to my photo. May be Billman can suggest the most appropriate name in English. I would propose : sickle ? wow! Super cool thread. I have started a new job, am poisoned by toxic sewer gas/black mold, am running on pills, have slept 4 1/2 hours in the last three days, so state of exhaution, but I am bound to have things to say later Very nice!!! Interestingly enough, to me, machete is a very major example of a traditional work sword with convex curvature. I do not consider hooked bill-like swords true machetes, nor for that matter are sugar cane knives, nor a variety of other square-tipped work swords to which the term is often applied. To me a true machete is curved backward (ie like a sabre), usually rather slightly, usually mostly at the tip, usually mostly on the true/front/cutting edge. Good old machetes do have distal taper, and it makes a particularly big difference in using quality in these thin swords. Billman, I am really enjoying you; you have shown up since I have been gone. Last edited by Billman : 20th March 2011 at 12:44 PM. Last edited by Billman : 20th March 2011 at 12:40 PM. Sorry for digging up such an old thread but I thought I'd post a sickle I bought awhile ago as it's somewhat similar to the "slashing-knife" in the illustration from Billman's post. I assume it's proper ethnographic categorization would be "rusty old American farm implement", but I could be wrong. There's no markings on the blade that I can see. It's hollow ground on one side and flat on the other, and it's bent to one side.